10x10x1 in ©2011 by Tracie Lauren. 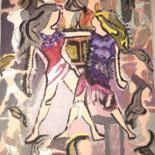 This is part of the Triptych Gemini Series. Emphasis shows two twins standing in the middle as though they are the center of attention. Everything else just fades in the background. The twins represent the Gemini symbol. They believe in teamwork that two minds are better then one. Double effort. Both have high confidence that anything can be accomplished and are egotistical. *Availible as a print or digital copy ONLY through Etsy. Contact for details to order.